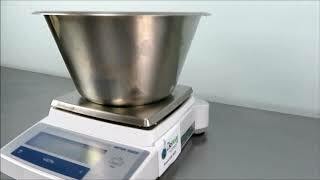 The Mettler Toledo PB1501-S Precision balance provides you with sturdy construction and easy to use functionality. This analytical balance features high contrast, backlit digital display where users can choose from 10 weight units, as well as built-in functions such as piece counting, percent weighing, dynamic weighing with automatic or manual start. This digital lab scale is built to last, with high-grade chemical-resistant diecast aluminum housing with a hook for weighing below the balance. This digital scale can be connected to a to PC or LC-P45 printer through the RS232C interface located at the back of the balance. The Mettler Toledo PB1501-S Precision balance has a capacity of 1510g, with a readability of 0.1g, and a repeatability of 0.8g. g, mg, lb, oz, ozt, GN, dwt, mo, m, tl. This Mettler Toledo PB1501-S Precision balance has been fully inspected and calibated with our in house weights. All of our lab equipment comes backed with our standard warranty. Should you have any questions, please don't hesitate to contact us.